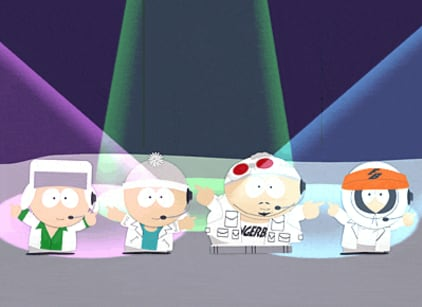 Cartman gets Stan, Kyle and Kenny to help him make a boy band, "Finger Bang" to try and earn $10 million. Cartman: Check this out, my mom made us costumes. Cartman: Yeah. This one's yours Stan, and this one is Kyle's, this one will cover up Wendy's hooters. Stan: Hey Cartman, how come your costume has like nose rings and facial hair? Cartman: Cause I'm like you know, the tough one. Every boy band has to have the one member you know, that's tough. Kyle: I want to be the tough one. Kyle: I wan't to be the tough one! Cartman: You can't be the tough one because you're Jewish! Mall Cop: Hey! What are you doin'? Mad Scientist: I've developed a new strain of anthrax which I will soon unleash upon all of North America! Mall Cop: Move along, sir.